With the long anticipated 2012 sophomore release Like Water, Like Air Campagne’s fresh and sincere voice is bound to reach new levels of recognition. Co-produced with her long-time musical partner Iago it indicates the arrival of a singular artist with unparalleled grace, vision and maturity. 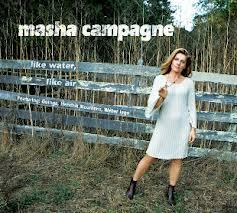 More importantly, it marks the recording debut of Campagne as a songwriter. Four impressive originals reflect a thoughtful attention to detail, both in the heartfelt lyrics and in smart, compelling arrangements. Adding to that are exciting collaborations with the prodigious Brazilian guitarist/composer Guinga and German harmonica and vibraphone virtuoso Hendrik Meurkens – the results are sensual, sparkling, and sure. Like Water, Like Air – Featuring: Guinga, Hendrik Meurkens, Weber Iago “He was the effortless choice for me as a co-producer,” says Masha Campagne about working with longtime friend and collaborator Weber Iago. And on Like Water, Like Air, her second full-length collaboration with Iago, the partnership could hardly feel more organic. Together, they leave an unmistakable stamp on the album’s 11 fabulous songs—some standards, some yet to be—which place the chanteuse fronting a roster of bold talents. Guinga proves himself a versatile artist of great tenderness and scope on two of his tunes. In lighthearted samba “No Fundo Do Rio,” Campagne’s buoyant lyric portrayals at once transport the listener to Rio de Janeiro, bringing the emotional level up a few notches. In a duet “Exasperada,” intimate voicings of Guinga’s guitar and Campagne’s intense delivery evoke an emotional watercolor portrait of love in a transient world.